Beacon Park Yard in Allston. Beacon Park Yard is as forlorn a place as there is in Boston today. The old Allston rail yard — sandwiched between the Massachusetts Turnpike, the Charles River, and Boston University — used to be a major freight hub for CSX. That was before the shipping giant pulled up stakes last year and traded Allston for a new freight terminal in Worcester. 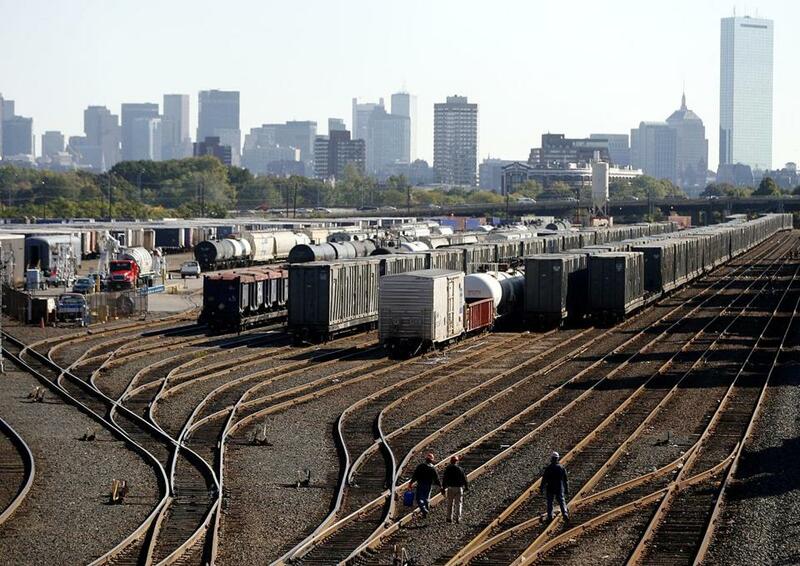 Now the Harvard-owned yard sits in silence, a maze of rusting railroad sidings sprawling over 140 acres of concrete, covered in a tangle of Turnpike lanes, ramps, and tollbooths. It’s a desolate place. But it also could become the site of Boston’s next great building boom. For years, Assembly Square in Somerville didn’t feel much different than Beacon Park Yard does today. The square housed a failed mall and a few ramshackle industrial properties. Now it’s a $1.2 billion neighborhood-building project, and a model for turning around rotten urban real estate. The state brought construction cranes to Assembly Square by securing money for a new Orange Line subway station and by floating the money for new roads inside the massive development. The Orange Line had long run through Assembly Square; the relatively modest T station investment completely shifted Assembly’s relationship with the infrastructure running through it, and unlocked real estate that wouldn’t have been developable otherwise. Beacon Park Yard today is Assembly Square before its Orange Line station. What’s needed is the vision, and the leadership, to make the land meet its potential. Boston’s downtown is in the middle of a construction spree that has turned a dingy part of town into one of the city’s hottest residential addresses. But if Boston wants to retain young families and continue to attract young workers, the region needs to pair a rapidly gentrifying downtown with significant new density around the urban core. This is the logic behind Assembly Square. And it’s why the region’s development future lies in Dudley Square, Forest Hills, Alewife, and Malden center, in Somerville’s Inner Belt and Union Square, and along the Fairmount line and the East Boston waterfront. And in Allston. Two huge state investments will soon open up the yard to the wider city. CSX left Allston as part of an effort, pushed by former Lieutenant Governor Tim Murray, to take control of rail tracks leading in and out of Boston; by owning the track rights, and relocating freight, the state will be able to lay more tracks and greatly expand passenger service. And as the state switches to electronic tolling, construction crews will be demolishing the Allston toll plaza, and knocking the bend out of the Pike around the old freight yard. The straighter highway, with fewer ramps, will leave behind a much more compact, buildable piece of land. Newfound elbow room on the commuter tracks that run through the yard means that significant new development can come without causing a traffic nightmare. Beacon Park Yard sits at a key junction in this prospective network: along the path from Brighton Landing to South Station, and from Allston to Kendall. It could be the site of a new West Station, a transit hub that would give Allston residents a quick ride downtown, and would enable the kind of intense development that wouldn’t be possible in a car-dependent site. If the state, the city, Allston residents, and Harvard line up together behind West Station, the Allston rail yards could easily be huge growth engine for the region. Without that vision, though, the yards could just as easily sit for decades.